Here at Boston Closet Company, we know January is the time for making resolutions. It is important to figure out what you want your life to look like in 2019. Does having an organized home sound appealing? Imagine walking in after a long day of work and not being greeted by a stack of unread mail or laundry spilling out all over the living room. Maybe this doesn’t apply to you and you are neat as a pin. Even the most organized among us can use a refresher on how to contain the clutter. Read on for our suggestions to create a cleaner space that will help you to start the new year off right! It can feel overwhelming when we decide that we want to “be organized”. Questions start flooding in: Where do I start? What do I want to be organized? How do I set up an organizational system and how do I maintain it? Will my family be willing to keep this up? With our helpful tips, it is possible to get organized—and keep things that way—in 2019. Make a list with specific ways you want to get organized. Make each item something you can accomplish bit by bit. For example, “organize the master bedroom closet” is too general. Try thinking in terms of “organizing all of the pants in my master bedroom closet” so the task is something you know can get done. Then break that task into individual steps such as “begin by getting rid of all of the pants that I no longer need”. This is especially helpful for larger and more complicated tasks that can seem insurmountable. It is also the day-to-day organizational habits that make all the difference. You don’t need to devote a whole day to making the pantry perfect, but if you make sure that most of the pantry is put away into assigned spots each night after dinner, you will be on your way to a more functional space. Think in terms of systems. There is a difference between simply purging and organizing. “Editing” our belongings is an important step in organizing. However, there is more to be done after that. Organizing encompasses a system or processes that you will use to keep track of items and store them efficiently. Check out the gallery of our custom organization systems! Labels will help you to maintain your organizational system and identify where items are quickly and easily. If you have children, this can be a useful prompt for them and will help make sure that chores get accomplished. Every living space has unique storage advantages and challenges. Think about what works for your closet, pantry or garage. 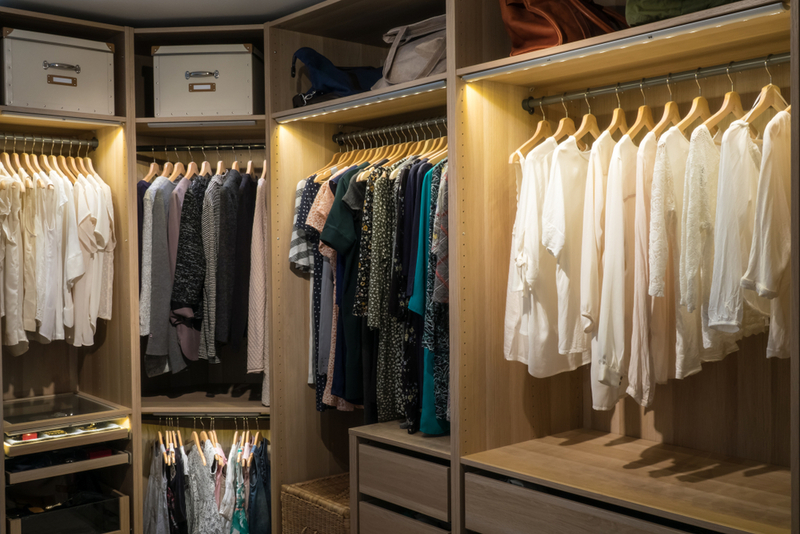 For example, a multi-tiered system may work for your closet to maximize space. Rods, built-in drawers and shelves can create more areas for storage. Boston Closet Company has many products to customize an organizational system to meet your needs. Contact us today for your free in-home design consultation!